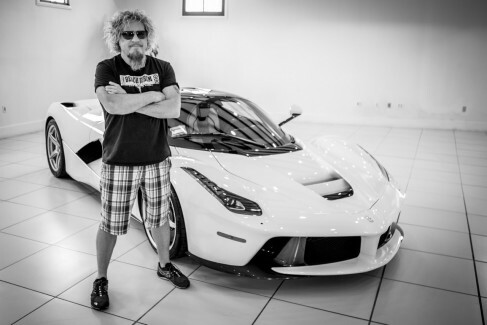 Sammy Hagar picked up his limited-edition, custom-made LaFerrari on Wednesday. ABC7 News Bay Area reports Hagar waited for a year to take delivery of the $1.3.million supercar. With only 499 of the models made every 10 years, the 2015 edition features a 949-horsepower gas-electric engine and a driver's seat molded to Hagar's body. The rocker has owned 25 Ferraris, but starting this one up took his breath away. “The car looked better than I ever imagined when I saw it,” he adds. “My anticipation to drive it was driving me crazy #ThreeLockbox HaHa. When I finally took possession of the car today after all the red tape involved in a special car like this, Kari and I put 100 miles on it. “And what a crazy fun hundred miles it was!!! The car is much faster than I ever imagined. It sounds like a monster of some kind. It gets way more attention than I want (daaah!). I'm getting used to it slowly before I really try to push it to my limit, which is way below the car's limit ... I'm sure of that after today! The band – which includes bassist Michael Anthony, drummer Jason Bonham and guitarist Vic Johnson – released their debut album, “At Your Service”, in May and entered the Billboard 200 at No. 78 with opening week sales of 7,000 copies.